Artwork of a bomb rock, from New Play Control! Pikmin. 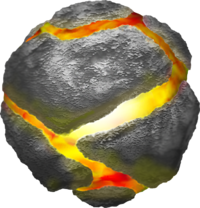 Bomb rocks (written as bomb-rocks before Pikmin 3) are explosive rocks in the Pikmin games. Upon being activated, a rock's fuse starts going down (represented by a colored wheel), and when it reaches zero, the bomb causes a violent explosion, capable damaging enemies, Pikmin, leaders and some obstacles. In the first and third games, they can be carried by Pikmin, but only by Yellow Pikmin in the former. In Pikmin 2, they are much larger and serve as obstacles instead of tools, with the exception being on the 2-Player Battle stage Hostile Territory, where they can be picked up and thrown by leaders. They can also appear as items in 2-Player Battle and Bingo Battle. Visually, they look like round rocks with cracks in them, where a yellow and red energy-based flow can be seen. Their sizes span from being a bit smaller than a Pikmin (Pikmin) to being larger than a leader (Pikmin 2); Pikmin 3's size is an in-between of the two other games' sizes. It should be noted that bomb rocks in the Wii version are bigger than the ones in the GameCube version (the latter are the size of a Pikmin). The explosions can trigger a chain reaction if they hit other bomb rocks. In Pikmin, a bomb rock explosion will instantly make all bomb rocks in the vicinity explode. In Pikmin 2, a bomb rock that gets hit from another's explosion will initiate its countdown, so the chain reaction is rather slow. In Pikmin 3, an explosion triggers a neighboring bomb's explosion in around half a second, resulting in quite a fast chain of explosions. A bomb rock exploding in Pikmin 2. Bomb rocks can be used in a number of beneficial ways. To do: Finish the list for Pikmin and Pikmin 2. If a bomb rock explodes near an enemy, it will damage it, depending on the creature's vulnerabilities. Some enemies can also swallow bomb rocks, to suffer even great damage once they explode inside. To swallow one, an enemy either has to be coaxed into eating a bomb rock lying on the ground, or chomp a bomb rock-carrying Pikmin, depending on the enemy. In Pikmin, the carrier Pikmin will also be eaten and killed, but in Pikmin 3, it merely gets tossed aside while the enemy swallows the isolated bomb rock instead. All grub-dogs but the Dwarf Bulbear and the Water Dumple. The Emperor Bulblax reacts to bomb rocks in a different way, in that if they explode on its tongue or inside of it, they will stun it for some time. Bomb rocks in Pikmin 3 can be used to instantly unearth buried fruit. Candypop Buds that take in Pikmin carrying bomb rocks in Pikmin 3 will shrivel and die right afterwards. In Pikmin 2, bomb rocks cannot be carried by Pikmin, but can be set off by attacking them. They can also spontaneously fall from the ceiling and instantly activate, and are also produced by Careening Dirigibugs. Volatile Dweevils carry bomb rocks on their backs, presumably for protection, even though they themselves are killed in the blast. One should never throw Purple Pikmin onto a bomb rock, as that can cause near-instant detonation, which will likely kill the Pikmin. Bomb rocks can even be petrified, so one should do that if in peril, but they will not release nectar or spray like many beasts do if destroyed in that state. Petrifying an inactive bomb rock will also activate it once it breaks free. Finally, petrifying a bomb rock in the same moment it is going to blow up will make it disappear without harm. Despite being obstacles and hard to control, bomb rocks in Pikmin 2 can also be used to one's advantage, with the aforementioned uses. Fixed-location bomb rocks are less exploitable, but enemies that can generate bomb rock explosions can be abused more easily. For instance, one can have a Careening Dirigibug destroy an electrical wire without Pikmin having to be involved. Bomb rocks can be found in several areas and function like in the main games. The timer starts ticking when a thrown bomb rock Pikmin hits the ground, and explodes after five seconds. A Pikmin holding a bomb rock can't climb up vines and will start running around in disarray if Olimar does; the bomb rock is also removed as a standby Pikmin option. However, if Olimar climbs down a vine, the Pikmin will remain on the same spot and remain an option until Olimar gets off the vine. Bomb rocks can clear harder material that Rock Pikmin can't, and are used in the fight against the Fiery Blowhog in Blazing Winds. Artwork of a Yellow Pikmin holding a bomb rock. The controls when dealing with bomb rock-yielding Yellow Pikmin are a bit complex, and varies slightly depending on the console. On the GameCube version of the game, throwing a Pikmin with a bomb rock will make it stay on the spot, but primed to use the bomb. It is possible to see that the Pikmin is not idle because its stem doesn't glow and its color doesn't become paler. If an enemy is close, the Pikmin will step back and throw the bomb rock at it. In this state, when called back using the whistle, they'll drop and activate the bomb, and run towards Olimar. If, however, the player wants the Pikmin to join the party without dropping and activating the bomb, they must have Olimar touch the Pikmin directly. Dismissing will cause these Pikmin to go to their own group, but will actually become idle, as seen by their color and stem. In this state, they will also use the bomb when near an enemy, but will no long activate it when whistled. In the New Play Control! version, switching to a different Pikmin while holding one (i.e. pressing when holding ) will treat Yellow Pikmin as being different from bomb rock-holding Yellow Pikmin. In addition, Pikmin no longer use the bomb when called to the group, regardless of scenario. Pikmin holding bomb rocks will not interact with objects when the group is moved, and when called to the yellow Onion, Pikmin yielding bomb rocks will drop the explosives on the ground without igniting them. Curiously, when a Yellow Pikmin throws a bomb rock, it'll warn nearby Pikmin to rejoin Olimar in order to stay away from the blast. However, if one throws a bomb rock-holding Pikmin next to a group of idle Yellow Pikmin, and calls the bomb rock-yielding Pikmin back with the whistle (i.e. make it drop the bomb rock), it will not call the idlers. In the 2-Player Battle stage Hostile Territory, bomb rocks can be picked up and thrown by a leader, which can be used to defeat enemies, or deal a serious blow to the opponent's Pikmin count. To perform this, one merely needs to run into a bomb rock for around one second, at which point it'll be picked up. Players can then press / to throw it (the distance is around twice as far as the reach of the GameCube game's cursor), or / to drop it in place. In both cases, the bomb rock will be activated. 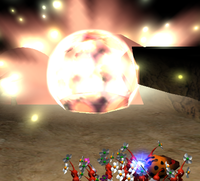 In every other point in the game where bomb rocks are found, they can be activated by being attacked, provoked (in the case of Volatile Dweevils), or dropped (in the case of Careening Dirigibugs). Controlling the way Pikmin behave with the bomb rocks is much simpler in this game compared to Pikmin – a Pikmin will always keep hold of its bomb until said Pikmin is thrown, in which case it will drop the rock exactly where it landed, and run back to the group with a cry. When dismissed, any bomb rock-wielding Pikmin will separate from the group of their type, making it easier to get only the bombers. Idle bomb Rock Pikmin will not automatically throw their bombs at enemies, like they would in Pikmin, and they still cannot interact with other objects, not even by charging. In order to coax an enemy into eating a bomb rock, there should be a Pikmin idling with one nearby. When the enemy tries to eat that Pikmin, it will dodge at the last second and the beast will catch the explosive instead. The following article or section is in need of assistance from someone who plays Pikmin. Particularly: Put in the rest of the bomb rock totals for each place that they are found. Bomb rocks are usually found inside tin cans, pipes, or large animal skulls. The Forest of Hope: In a tin can, near the great plain with Red Bulborbs, in another one near the place where the Yellow Onion is originally found. The last can is in the place where the Nova Blaster is found (15). On the first day the area is visited, 3 are found out of the cans, such as in front of the wall closing in between the Yellow Onion and the Whimsical Radar. The Forest Navel: In a pipe, near the pool where the Number 1 Ionium Jet is found. There's another one next to the place the Gravity Jumper lies (15). The Distant Spring: In a giant skull, inside a hollow tree stump guarded by a Spotty Bulbear (5) and in the beach where the Massage Machine is found. There is another skull near the pool with the Water Dumples to the west (5). The Final Trial: In a pipe, on a high place to the right of the starting point. There are three other pipes in the cliffs surrounding the arena where Emperor Bulblax is fought. Overall, there are 50 bomb rocks in this stage. The Impact Site: Inside the box that the Pikmin have to push on the first day. The Forest of Hope: In a tin can, near the place where the Yellow Onion is originally found. There are also some in the ledge that leads to the arena where the Armored Cannon Beetle was. The Forest Navel: There are no bomb rocks in the level. The Distant Spring: There are no bomb rocks in the level. The Final Trial: In the walkway around the Emperor Bulblax arena where the pipes are normally. There aren't any inside pipes. Subterranean Complex: On almost every floor, there is at least one bomb rock or bomb rock-related enemy (Volatile Dweevil or Careening Drigibug). Bulblax Kingdom: On some floors, especially near buried or partially buried treasure, bomb rocks may spawn. Cavern of Chaos: On sublevels 1 and 4, they are present, and in the latter, can be used to defeat Emperor Bulblax. Submerged Castle: Many bomb rocks and Careening Dirigibugs are present on Sublevels 2 and 4. Hole of Heroes: Bomb rocks, Careening Dirigibugs, and Volatile Dweevils are found on sublevel 2. Frontier Cavern: Bomb rocks can spawn on sublevel 3. Shower Room: Some Volatile Dweevils can be in the pipes on sublevel 6. Dream Den: Bomb rocks and Careening Dirigibugs are found on sublevel 3. Concrete Maze: Many bomb rocks and Volatile Dweevils fall from the ceiling. Abduction Den: Careening Dirigibugs can spawn bomb rocks. Cave of Pain: Many Volatile Dweevils and bomb rocks fall from the ceiling. Bully Den: Two Volatile Dweevils are found in the pipe structures. Hostile Territory: Many bomb rocks are littered here. Interestingly, leaders can pick up bomb rocks and use them. Note: a Volatile Dweevil can appear in any 2-player stage as a roulette item. 2 are found directly west of the landing site, inside of a dirt mound. 2 are found near the waterfall to the east of the landing site, inside of a dirt mound, and 1 is found exposed next to them. 3 are found in the northern section of the Shaggy Long Legs arena, inside of a dirt mound. 3 are found in the cave containing a Medusal Slurker that holds a Juicy Gaggle, inside of various eggs. Distant Tundra: A pile of 10 bomb rocks is found within a cave filled with Dwarf Bulbears, Fiery Blowhogs, and one Spotty Bulbear. They are intended to help defeat the Bulbear, but can cause a devastating explosion due to the amount of bomb rocks in the pile. Twilight River: Four are found on top of a can near the Puffy Blowhog, but they require either Yellow Pikmin or Winged Pikmin to reach them due to their height. Formidable Oak: Three are found in a dirt mound enclosed by a crystal wall near the start of the cave complex. Another three are located in another dirt mound, this one behind a dirt wall in the portion of the first room that contains the fragments. Icon used for the mine. Mines are Bingo Battle exclusive explosives that attach to anything. They act similar to bomb rocks in the way that Pikmin carry them, and they can explode. This item is most commonly obtained from a roulette spin, which can be caused by retrieving a Cupid's Grenade, but can also be found on layout C of the Jigsaw Colosseum. When the "mine" roulette wheel item is used, a mine spawns near the player's group, and at that point, the player can issue a Pikmin to pick it up. The Pikmin can then be thrown at the ground, a wall, a fruit, or anything else, and where it touches, the mine will stick. From this point on, the mine will be armed, and will detonate whenever a leader nears by. If there is a mine on a fruit or any carriable object, and that object is brought to an Onion without the mine blowing up, the explosive will slide off and fall on the ground. The mine resembles a metal barrel with a light on top. This light is green when the mine is unarmed. When it sticks onto something, the light will turn yellow, and two yellow lighthouse-like beacon lights will spin around its equator. A "boop" sound can also be heard every second or so. When it detects movement nearby, the light and beacons turn magenta, it beeps faster, and after three seconds, it explodes. To do: Elaborate and add to the glitches article. In places where a bomb rock falls near Mitites, such as sublevel 6 of Bulblax Kingdom, there is a chance of it being launched back into the air if it lands on one, landing somewhere else on the level. In Pikmin, Yellow Pikmin will sometimes fail to pick up bomb rocks, and will instead perform their "picking up" animation repeatedly. Whistling them and having them try it again is usually enough to fix the issue. In Pikmin 2, bomb rocks cause 500 points of damage. While the values for Pikmin and Pikmin 3 are not exactly known, observation indicates that the bombs are just as strong in Pikmin, and are even stronger in Pikmin 3. A few bomb rocks in a can. A bomb rock about to explode in Pikmin 2. A closeup of a bomb rock in Pikmin 3. Olimar standing next to some bomb rocks. A bomb rock as seen in early Pikmin 3 footage. A Blue Pikmin carrying a bomb rock in Pikmin 3. A Red Pikmin carrying a bomb rock in Pikmin 3. A Rock Pikmin carrying a bomb rock in Pikmin 3. An unused texture from Pikmin, showing a Red Pikmin with a bomb rock. The other textures can be found here. The data file explaining bomb rocks. Screenshot of Captain Olimar holding a bomb rock. A bomb-rock exploding in Pikmin. Drawing used to represent Pikmin killed by explosions on Pikmin 2's high-score screen. Artwork of a Pikmin holding a bomb rock in Hey! Pikmin. It is suggested that Red and Blue Pikmin could once carry bomb rocks along with the Yellow Pikmin in the original Pikmin, as seen in some unused files. All Pikmin gained this ability in Pikmin 3. If a Pikmin is holding a bomb rock when it is called to the Onion, it will leave it beneath the Onion's pillar of light. Bomb rocks in Pikmin actually shrink and disappear if they touch the water. This can be seen on The Forest Navel where, on the southernmost point of the map, there is a tube with bomb rocks. If Olimar lies down next to the one outside the tube, closest to the water, he will begin sliding towards the lake and drag the bomb rock with him. In Pikmin 2, if a bomb rock in a cluster of bomb rocks explodes off-screen, it will not activate the others. This is because off-camera objects have special behaviors. The bomb rocks' look may have been inspired by the real life cypress cones. Pikmin holding bomb rocks in Pikmin 3 will not roll when dodging, but will walk faster to keep up with the dodge. In Pikmin 3, if a Pikmin is already under the effect of another hazard (such as electricity), it can't get killed by an explosion. Bomb-rock Translation taken from the NEW PLAY CONTROL! Pikmin website. Translation taken from the Pikmin instruction manual. This page was last edited on March 16, 2019, at 13:35.